Everyone really wants to have that beach body, like the kind you see in the magazines, but attaining it is nearly impossible. You need to hit the gym every day of the week. You need to eat crazy amounts of protein. You need to lift like a maniac and you need to hit the tanning salon to get that bronzed Olympian god look. It’s not exactly easy to fit all that into your already busy schedule. Does that mean you should just give up on that perfect Baywatch body? No, of course not! It just means that you need to get a little bit creative. 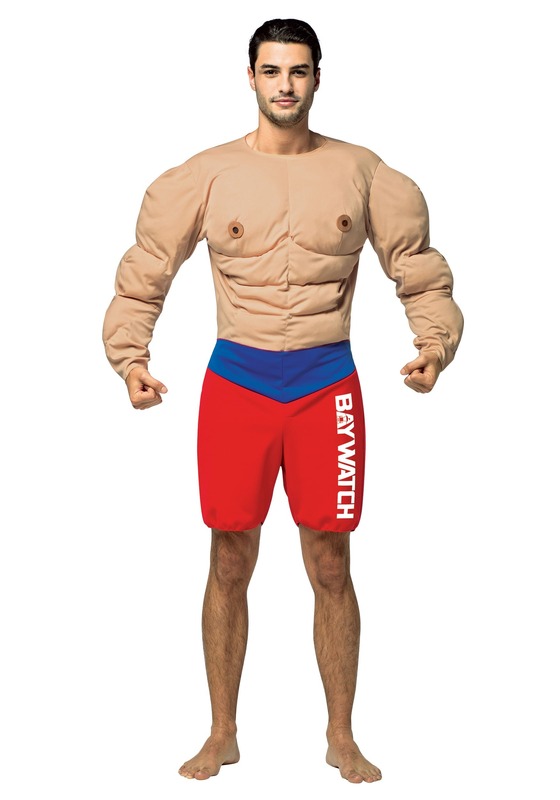 This adult Baywatch costume is an officially licensed outfit that helps you achieve that male model physique that you’ve always dreamed of, and the best part about it is that you never have to step foot in a gym to get it. The costume comes with a fake muscle chest with rippling abs designed into the front. It also has a pair of comfy life guard shorts that have the Baywatch logo on them from the 2017 film. Slip the costume on and you’ll have a bod that looks tailor made for the beach! Just remember that this costume does not enhance your swimming abilities, so don’t go dashing into the surf while wearing this thing just to play the heroic role of lifeguard. You’re much better off just flexing those biceps at all the beach hotties that are hanging around.